NFL, NBA and a music star will grace the "Beast Mode" shop on Thursday, so that kids in Oakland can climb on Black Santa's lap. 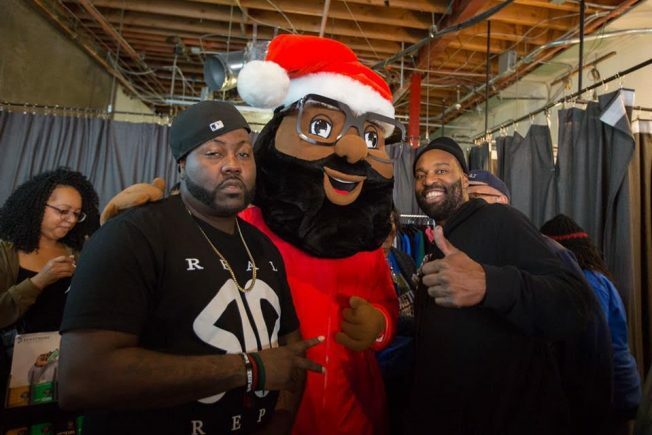 Black Santa, conceived and created by ex-Warriors player Baron Davis about four months ago, is more of a dancing around and shaking-your-hand kind of Santa, said company spokesman, Michael DeFlorimonte. Still, kids who show up can get a free picture of themselves with the unconventional Santa, whose face is sort of like a Disney bobblehead character, and a gift certificate for hot chocolate. Families will also get to take pictures with Davis, Oakland-raised Marshawn Lynch, who played for the Seattle Seahawks and Buffalo Bills and owns the Beast Mode store, and Oakland rapper Too $hort. Black Santa has traveled to New York and Atlanta, DeFlorimonte said. But this is his first stop in Oakland. "Oakland makes sense," DeFlorimonte said, "because of the high number of African Americans. But he appeals to everyone." Families are asked to bring toys to donate to the East Oakland Collective, a cohort of millennials who want to bring together the voices of underserved people of color, Serenity House and the East Oakland Youth Development Center. Proceeds from Black Santa sales will go toward Lynch's Fam 1st Family Foundation. Photos will take place from 1 p.m. to 3 p.m. at Lynch's shop, Beast Mode, 811 in Broadway, and there's a city Christmas tree lighting at Jack London Square from 4 p.m. to 6 p.m.